Sailability Crystal Bay - Tuesday 2nd of April, 2014. Picture by A J Guesdon. If this old world starts getting you down, to quote the opening phrase from a famous song, may we suggest you change the rest of that line’s lyric and visit the wonderful friendly volunteers and sailors frequenting the Crystal Bay chapter of Sailability. This quite new initiative has been set up to meet the aspirations of some Pittwater sailors who wish to compete at State, National and International level and they are being ably supported and encouraged by a growing band of volunteers. Over the weekend of March 22-23 the HANSA Classes Pittwater Regatta 2014 - Skud 18 Nationals & Liberties NSW Championship, hosted by the Royal Prince Alfred Yacht Club, was held. The Australian Hansa Class Association Inc was established in 2005 as the Australian Access Class Association and is affiliated with Yachting Australia. The objectives of the Association are to: Promote and develop Hansa Class racing under uniform rules at a local, state and national level for people of all ages and abilities - State and National Championships are held annually; Provide a medium for exchange of information among Hansa Class sailors; Encourage and foster the enjoyment of the competitive, recreational and social aspects of sailing. The RPAYC supports all sailors with a wide range of disabilities whether by age, accident, illness or birth and through its Integrated disAbled Sailing program (IdS) encourages these sailors to become part of the club. Integrated disAbled Sailing (IdS) provides financial and volunteer support to integrate sailors with disabilities into the club’s regular sailing program. An initiative of the Royal Prince Alfred Yacht Club, IdS will promote and support inclusivity for keen sailors of ALL ages and abilities as well as providing support for the not for profit, volunteer based Sailability organisation. We visited Sailability Crystal Bay on Tuesday this week and met some of these great volunteers and sailors to learn more about this new venture. What is the difference between Sailability Pittwater (at Bayview) and Sailability Crystal Bay? 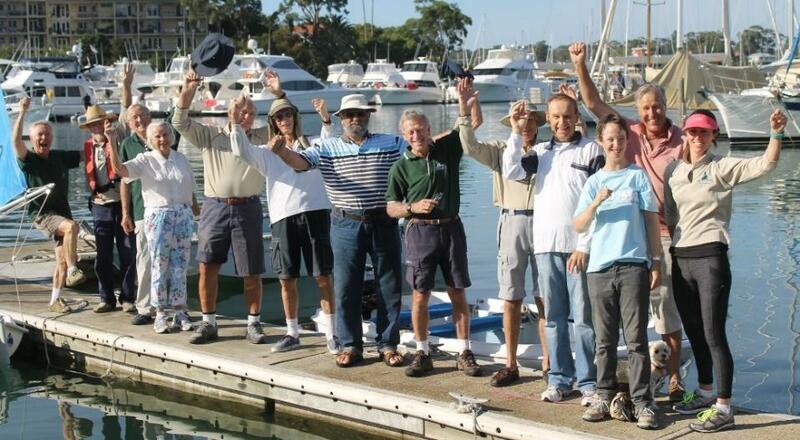 Michael Woolley: Sailability Pittwater is for anybody with a disability to go or try sailing. If they show an aptitude or ability for sailing then Sailability Crystal Bay is the place to come because this is the competitive side of it. We’re training people for State competitions, National competitions, Special Olympics, Paralympics and events alike these. If we see people that would like to go on, and race, then this is the place for them at Crystal Bay. Michael Woolley: If it has a sail, I’ll go sailing. I’ve been sailing for many years and when I retired was looking for things to volunteer to do, to help and put something back into the community. I didn’t know about Sailability until I went to a community centre at Dee Why and requested a list of voluntary organisations in our area. I thought ‘that’s for me’ and joined three or four years ago and now belong to Sailability - Pittwater and Sailability – Crystal Bay. Allan Jones how long have you been doing this here? Allan: Bob (Hamilton) and I have been here for about 14 years. Bob: In 1972 he and I got together through sailing out of RPAYC. How long has the Crystal Bay chapter of Sailability been going? Bob: it’s about two weeks old. David West: I’ve been doing this about three months. I love being on the water. I’m retired now and like doing something with my time. I sailed my boat up until 2003 and since about 1995 have been a Race Officer with RPAYC on the Committee Boat. When you get older and arthritic you can’t sail as well and with these modern boats you need to be able to jump around. I’d heard about this fellow (indicates Allan) and came along. Originally I got involved in Sail Sydney – a Regatta that was held in 2012, where I was a Liaison Officer for Yachting NSW at Rushcutters Bay helping Sailability people. Unlike some of my fellow sailors, those people never complained, they smiled all the time. I thought that was great so I chased it up and got in contact with Allan. What sort of things do you do here David? David: I’m just learning the ropes, excuse the pun; I’m learning how to put the marks in the water and connect up the outboard, getting this off and on the trailer. So you are also getting an insight into sailing yourself? David: I am. I didn’t have much knowledge at all beforehand. There’s so much to learn. Steven Piry: I was sitting in a doctor’s surgery where they had boating magazines. One of these had a big three page spread on Sailability. I’d just retired and thought this sounded like a great thing to do. I somehow got hold of Allan’s number, sent him an email which he replied to and invited me here and has made me very welcome. I’ve been here ever since. Veronica Carey: I’m Allan’s wife. We met through volunteering with swimming at the Allambie Heights Cerebral Palsy Centre. Allan has always been involved with the centre at Allambie. I think Sailability at Crystal Bay is an excellent initiative. This is a wonderful opportunity for sailors who are beyond having a fun sail in a boat. Here they take responsibility for their own boat, practice their skills and go to the competitions and they succeed, Internationally and at State and in local competitions as well. There are some fantastic sailors here. Keith Sinfield: I got involved with Sailability when Alyse was getting ready for the Special Olympics. I organised the coaching here for her at Royal Prince Alfred Yacht Club. Alyse was very good and did well. I got involved with Sailability then. The thing about it for me is that it is so inspirational. When you speak of the difference between here at Crystal Bay and Pittwater – here they’re striving to achieve something and to get results. They are learning so much from this – rules, tactics, perseverance. Jim Moran: I was involved with Rowland Reserve first. I saw the Notice and came down to there. I work with special needs people through quite a bit of my professional life. I used to teach High School and found special needs people were a lot easier and nicer to work with. Most of my life I have done some sort of volunteer work and as I’m new to the area have found this is a great way to meet some lovely people as well, the cream of the crop really. 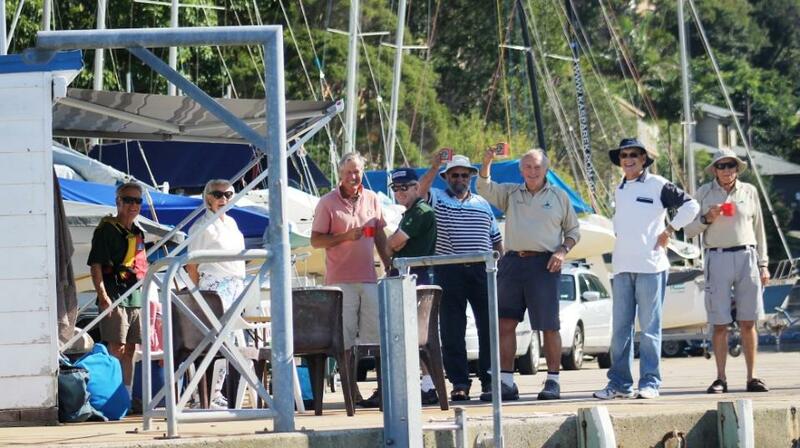 To be out on Pittwater is such a great privilege – it’s such a beautiful place. Craig Orr: I’m from South Australia and originally I was helping out a friend there who asked me to come down and help one day. I immediately loved it – it was just brilliant. You have been sailing for a while though? Craig: Many many years. My very first boat was a 42foot steel ketch named ‘Rosie’, I was sailing her in Queensland – so I started big and am now going the other way. So you shall be doing some intensive coaching? Craig: That’s what we were doing before and hopefully we’ll keep doing that. What we focus on mainly is concentration at this stage – thinking about what you’re doing while sailing and with this kind of sailing you do have to concentrate for a long period of time. You can’t switch off at all during a race otherwise you don’t get the result you are after. You have to be switched on from the start to the finish. Linda: I’m going to sail 303’s in the Nationals. This is the HANSA Nationals for Liberties and 303’s. I’m sailing double with a friend of mine who is a paraplegic – he’s just amazing. I’ve never been to Adelaide and I’m enjoying sailing on other waters, other kinds other than Pittwater – this will be a different. 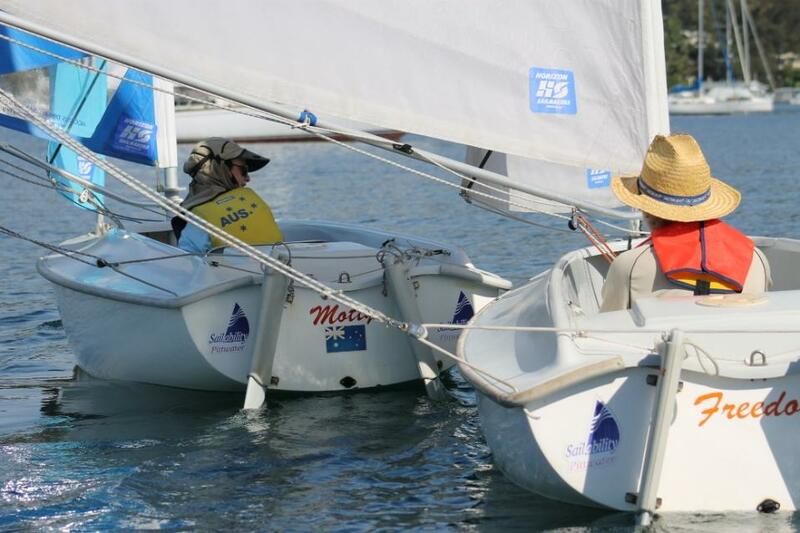 Linda is competing in the 2014 Combined Australian Hansa Class Championships being held at Goolwa Regatta Yacht Club. These races will run from April 17th to April 21st and incorporate the Inaugural South Australian Hansa Class Championships. Classes sailed will be the Hansa 2.3 Single Person, 2.3 Single Person (Servo), 303 Single Person, 303 Two Person, Liberty and Liberty (Servo) divisions. The Goolwa Regatta Yacht Club is located in the historic river-port of Goolwa, near the mouth of the River Murray in South Australia. Formed as the “Goolwa Regatta Club” some time prior to August 1854. In 1969 the club was renamed the Goolwa Regatta Yacht Club in order to cater for the booming interest in sailing in the area. Today it is the home of Goolwa's Yachting community with modern Clubhouse facilities, including a licensed bar, lounge, shower, dining and barbecue facilities. “This will help Alyse coordinate the three essential components for skippering any centreboard dinghy, tiller mainsheet and weight distribution. In other words steer using a tiller extension while hiking and setting the main by herself and making all decisions about tactics by herself. Alyse has gone ahead apace from then, coming third behind aficionados Gregory-John Hyde and Lachlan Clear in the March Regatta. Her Tuesday trainings sessions are in preparation for future Special Olympic Regattas. Today, Sunday April 6th 2014, marks the first ever United Nations International Day of Sport for Development and Peace. This is a day which highlights the power of sport as a universal language in bringing people together. 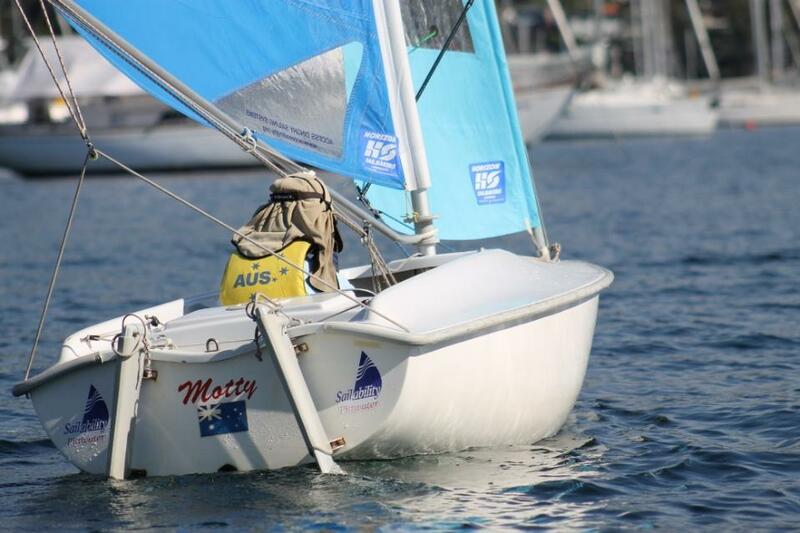 Sailability Crystal Bay is clearly a great example of this wonderful ability for sports to bring all together in a spirit that exemplifies what is best about being a sailor, a sportsperson or part of the support team and getting to practice your sailing on Pittwater. 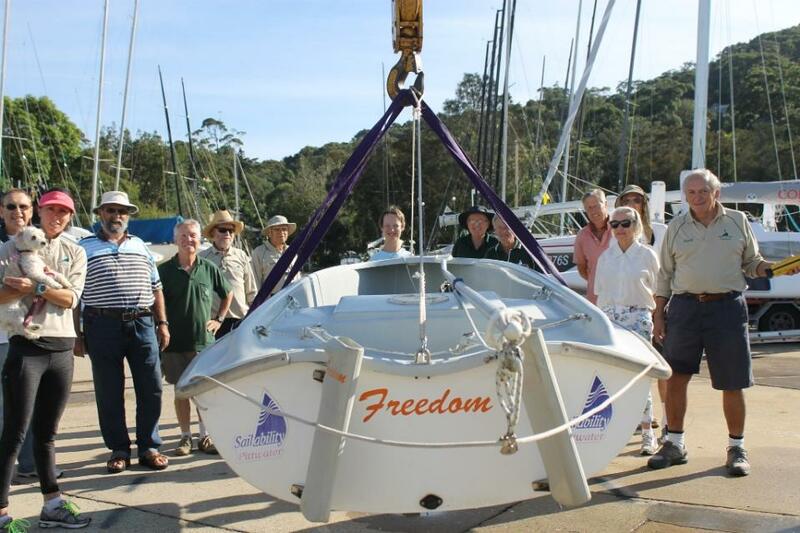 Sailability Pittwater has been in existence for over 16 years now (April each year is anniversary) and is an established part of our community. With the launch of Sailability Crystal Bay, providing brand new opportunities for some of Pittwater’s finest Sailors, we have a double happiness creed developing for all who involved themselves in being on the water. Alyse Saxby and Bob Hamilton - picture by Damian Devine. Crane to Lower boats into water . Report and Pictures by Damian Devine and A J Guesdon, 2014.